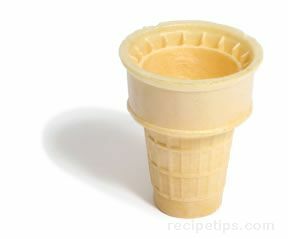 A kitchen utensil that is made to form ice cream into a slightly rounded or a well-rounded ball shape as the ice cream is taken from the container and placed into a cone, a bowl or onto a dessert. Ice cream scoops are available in many different styles, but they are all well rounded, some more than others that vary from flatter spade formed scoops to very round ball-shaped utensils, some with extractor mechanisms. The spade shaped scoops provide a serving that is less uniform and not as rounded for use when placing an irregular amount on desserts or when packing ice cream into bowls, cups or cones. 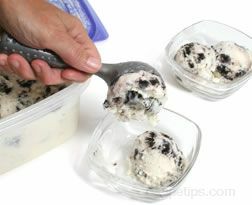 The spade scoop also works well to remove ice cream around the sides of round containers. 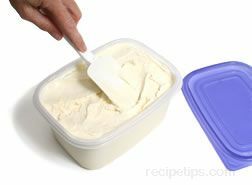 In addition, some spade scoops are made with hollow interiors that are filled with a defrosting fluid so the warmth of the hand warms the fluid so the scoop cuts through the ice cream more easily. 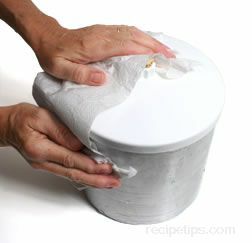 However, this type of spade with the sealed fluid should not be placed in boiling water or in dishwashers where temperatures exceed recommended levels, such as 140ºF. Ball scoops deliver round servings for times when a well-formed round shape is required, such as topping cakes and pies with ice cream or when filling circular cones with round scoops. 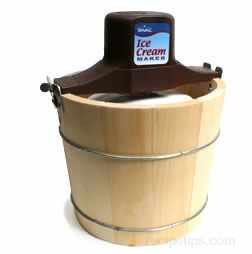 Common ball scoops are available in different sized portions with a fixed shape and no attached mechanisms or as a scoop with extractors that help remove the ice cream. 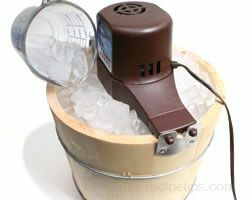 Extractor scoops have a lever on the handle which activates a metal extracting bar that moves under the ice cream and around the scoop to loosen or free it from the scoop when placing the ice cream on a plate. Personal preference is the most common method of purchasing this utensil, since spade shaped scoops or ball scoops each serve the purpose but in a slightly different manner.